The festival weekend was great, filled with sweet films. Saturday night was particularly amazing! Lots of creative brains out there! In case you missed out, read this piece! It’ll give you a taste for next year! -C.M. When I think of film festivals in Calgary, the $100 Film Festival always comes to mind first. It is presented by the Calgary Society of Independent Filmmakers (CSIF) and brings experimental filmmaking forth in a three-day viewing exclusively of Super 8 and 16 mm films. This year, the festival runs March 7, 8 and 9 at the now independently-run Globe Cinema. Paul Stickney, the Globe’s newly appointed manager, says he is thrilled to see the Globe serve as venue to the festival. James Morison was the original CSIF member and festival founder who saw the festival as a realistic opportunity to make and showcase his own films. He calculated that three rolls of Super 8, worth roughly $90, were sufficient for the kind of films he wanted to make. 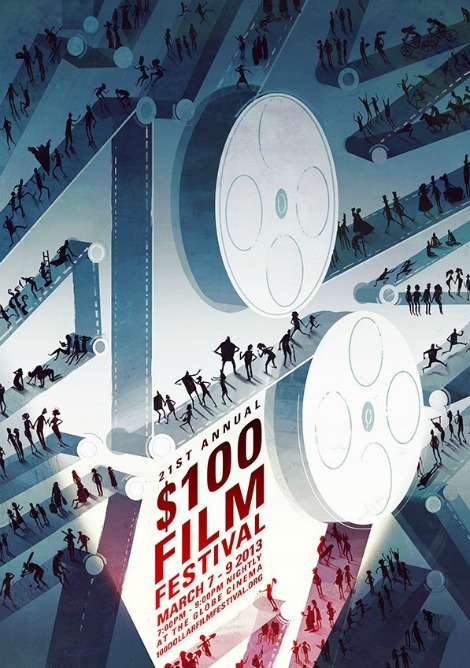 Rounding up to allow for some wiggle room, the $100 Film Festival was created. “The whole thing was to make a movie under 100 dollars and, back then, people were using film anyway, so using Super 8 or 16 mm wasn’t a novelty. Over the years, we dropped the financial restrictions. Now, that everything is digital, it’s sort of become a niche festival in that way. It’s not about the budget anymore, it’s about the medium [used],” says Nicola Waugh, CSIF’s current programming director, communications director and festival director. She says most films made now are most likely over the original budget although she thinks it can still be done. Paul Clipson, this year’s festival’s visiting artist, confirms Waugh’s belief. “Super 8 is still the most affordable motion picture film and it still maintains all of the qualities of film’s texture, saturation and aerial perspective,” he writes via email. Clipson is the audio/visual technician and projectionist for the San Francisco Museum of Modern Art and a well-accomplished filmmaker and installation artist. He will be running a festival workshop/artist talk on March 9 at the CommunityWise Centre for a $5 admission. He’s won awards for his films at the festival two years in a row and is very much honoured to be this year’s visiting artist. He works predominantly with Super 8 film and says the lack of instant replay is what makes shooting Super 8 a completely unique experience. “The fact that you can’t rewind [to] watch what you’ve just shot on film [and] have to wait for as long [as] a week before you can see it forces you to completely trust your senses and beliefs,” he says. Caitlind Brown, a long-time CSIF volunteer and self-professed film lover, had her short film, Magicontrol, showcased at the festival in 2010. “The $100 Film Festival is undoubtedly the most daring experimental film festival Calgary has going. There’s something magical about celluloid and, because all of the content screened at the [festival] is actually on film, [it] showcases a process-based and incredibly authentic aesthetic,” she writes in a Facebook message. Murray Smith, a Film Studies graduate from the University of Calgary and now a web developer by trade, was a juror for the festival in 2010 and 2011. “Back when I was into film, I reasoned that the extra work it took to shoot on film made it a better learning experience. You get to know the bare bones of photography because chemicals are far less forgiving than pixels,” he shares in a message. The process-based and authenticity of Super 8 and 16 films seems to be what draws filmmakers every year to the medium-based festival along with curious-minded audience members. In this fast-paced and technology-driven world, I can’t help but feel that we’re trying to bring ourselves back to old practices, whether it’d be developing our own photos in a dark room to wanting to process our own Super 8 and 16 films. That sense of touch and interaction seems to be predominantly missing in our current lives. “It’s the tactility of it that’s lost and lost in so many things these days. Sure you can hold an iPhone, but [it does not compare] to hold[ing] a polaroid photo or expos[ing] that film and cut each frame how you want it to be? It becomes so much more emotionally charged [to have] this physical experience with actual celluloid,” she says. At the CSIF office where I met up with Waugh, I caught up with CSIF’s production director, Yvonne Abusow. She helps with the festival’s Super 8 and 16 projection and has been doing it for two years now, alongside two other projectionists, who, on their part, have been doing it since the humble beginnings of the festival. Last year, she mostly stayed in the booth and made sure everything ran smoothly. She shares that light bulbs can sometime explode or a belt in the projector can give way and that it is really the only tricky part about projection. “There can always be technical difficulties,” she admits truthfully. Nostalgic theories and projection mishaps aside, Waugh and I talk about the festival’s commission film project. Kyle Whitehead is one of the festival’s commissioned artists. He is currently the production coordinator at Emmedia, a member-based organization that provides equipment access and programming opportunities similar to the CSIF. “The commission project is the first of its kind that we’ve ever done. We got a grant from Canada Council [for the Arts] to get seven filmmakers to make original films for the festival,” says Waugh. Once these films are showcased at this year’s festival, the CSIF is then responsible for getting these commissioned films onto the international festival scene . Whitehead’s 16 mm film, Semper Porro, Latin for “ever forward,” was shot during his residency at Film Farm, an “independent imaging retreat” in Mount Forest, Ontario. It is ran by Canadian filmmaker Philip Hoffman. “[Hoffman] has a huge barn set up as a full film production facility. He teaches most of the year at York University in Toronto and, every year, he invites roughly 10 to 12 filmmakers out to his farm,” he shares. Whitehead started off with about 100 feet of film that he exposed with a Bolex – a 16 mm camera – and spent the rest of his time on the farm “contact printing” the film, a process similar to photo printing in a dark room. “[Contact printing] is basically a process where you sandwich the original negative with a fresh piece of film and run it through a contact printer which re-exposes the fresh film through the negative. It’s basically like duplicating the original film [by re-printing] the same images in layers over top of each other,” he explains. The result of this process was 400 feet of manipulated film that created abstract compositions. Then, Whitehead split-toned the original black and white film with colour toners. “What the toners do is replace the black and white emulsion with a coloured salt,” he says, more precisely, revealing he used a blue toner and a copper toner. “‘Splitting-the-the-tone’ means you tone it through one toner – the blue first. You put [the film] in the developer for a few minutes and then put it in the second toner [which then] creates combined tones on the same frame,” he continues. The sound for the film was surprisingly not added later on. It was what Whitehead describes as the “consequences” of the specific process he went through to acquire that particular sound. “The sound is directly derivative of the images. It comes directly from the film itself,” he says of the raw and unedited process. So, what does it sound like? Whitehead says working with 16 mm, or Super 8 for that matter, is very much an artistically-oriented organic process. He says that going into the project, he had no idea what the film would look like. The $100 Film Festival runs from March 7-9 at the Globe Cinema. Tickets for the festival can be bought at Bogies’ Casablanca Video and at the CSIF offices or at100dollarfilmfestival.org.